The speed of innovation within the consumer technology industry in remarkably fast; and no other factor plays as big a role in this rate of change as do consumer expectations. Whether it is the release of a new feature that revolutionizes how consumers view a certain technology, or an innovative product that never gains traction in the market, consumer expectations can disrupt entire technology sectors. 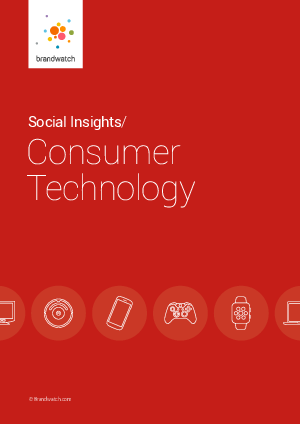 In the Brandwatch Consumer Technology Report, online conversations are synthesized into relevant insights to understand the current state of the consumer tech industry. Specifically, the report includes demographic analysis of technology consumers, insight into consumer and brand language, and the Consumer Technology Social Index.